Last week, Oakland teachers across the district held demonstrations at their schools to demand a new contract. Outside of Oakland International High School in Temescal, a group of about 20 teachers and students held signs that read “Support Oakland Teachers” and “End the teacher crisis.” Cars passing by honked to show their support. Susan Keen, a history teacher at the school, led a chant. “When education is under attack, what do we do?” yelled Keen. “Stand up, fight back!” the group chanted in response. Oakland public school teachers have been working without a contract since July, 2017. The Oakland Unified School District (OUSD) and the Oakland Education Association (OEA), the teachers’ union, have been in negotiations since January of that year. Two central issues have kept the sides from reaching an agreement over the last 20 months: teacher compensation and class sizes. The union has sought to phase in a class size reduction of one student per class per year over the next two years. At schools with high percentage of students who are either English learners, foster youth or receive free or reduced lunch (which indicates that they come from a low-income houseshold), the union is asking for a reduction of two students per class per year. District officials have proposed a reduction of one student per year for only physical education and fine arts classes. The union also sought a 3 percent salary raise for teachers plus other school staff, such as nurses, counselors, and librarians, for the 2017-18 school year; a 4 percent raise in 2018-19 (with 1 percent coming from Measure G1 funding); and a 5 percent raise in 2019-20. Measure G1 was a parcel tax to fund salary increases for teachers, as well as art and music enrichment programs for Oakland middle school students. It passed with 82.24 percent of the vote in 2016. The OUSD’s offer was no raise in 2017-18, a half-percent raise with 1.5 percent bonus from Measure G1 and extra hours worked in 2018-19, and a half-percent raise with a 1.5 percent bonus from Measure G1 and extra hours worked in 2019-20. “We’re frustrated. We’re at a breaking point. And we’re willing to fight back,” said Keen, who is a union site representative for her school. The negotiations began with a few agreements in early 2017. Both sides were able to agree on the school calendars for the next several school years, along with a plan to implement affirmative action policies in the district’s hiring process. But the two sides have been unable to find common ground on issues that would have financial effects on the district. The district’s precarious financial position has hung over the negotiations throughout the process. In January, 2017, the OUSD was in the midst of a leadership change following the abrupt resignation of former Superintendent Antwan Wilson in late 2016. Wilson left the OUSD with a budget deficit of about $30 million, largely due to overspending on administrators and outside consultants. Superintendent Kyla Johnson-Trammel was named Wilson’s successor in May, 2017. Facing a potential state takeover of the district, district staff and the school board approved about $22.6 million in cuts for the 2017-18 school year. That December, the board approved another $9 million in midyear budget cuts, despite protests from the public. Negotiations between the teachers’ union and the district failed to make significant progress through 2017 and up until May, 2018. Given the district’s budget woes, a raise in teacher salaries was the primary sticking point. Angela Badami-Knight, a former Oakland special education teacher and the manager of educator community at GO Public Schools Oakland (GO), a non-profit that advocates for improved fiscal practices in the district and collaboration between public and charter schools, has been following the negotiations closely. “It seems there’s a disagreement about whether or not the district is financially able to offer the things that the OEA wants, or even come close to that,” she said. “Teachers can’t afford to live in Oakland. It’s a very emotional, personal subject. If I didn’t have my partner’s salary, I couldn’t afford to rent in Oakland,” Sbani said. 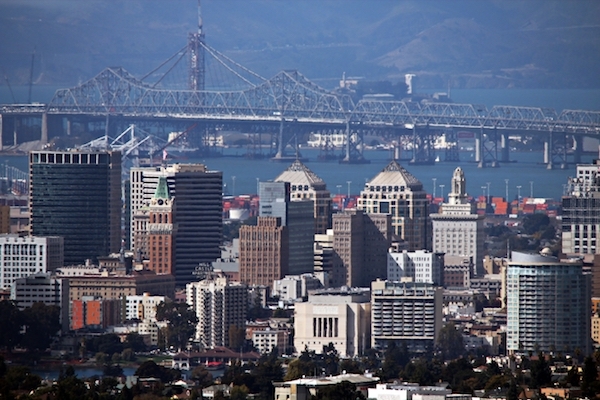 Rent prices in Oakland have grown by over 50 percent since 2012, with the median rent cost going from $1,952 to $2,950, according to a study by Trulia, a company that aggregates housing market information. The median sales price for a house in Oakland is up to $750,000 as of April, 2018, according to Trulia. While teacher salaries have also grown during that time frame, Sbani said it’s not enough, particularly for teachers who want to buy a house. “There’s a lot of conversation among a lot of teachers that I know of moving outside of Oakland and buying a house in Crockett or Vallejo or El Sobrante or other places that are more affordable,” she said. According to California Department of Education’s J-90 report on salaries in 2016-17, Oakland teachers get paid less than their peers in nearby districts in Alameda County. The starting teacher salary in Oakland was $46,411, which ranks in the lower half compared to other districts in the county. In nearby Hayward, a new teacher started with a salary of $61,672. For experienced teachers, who have 10 years of experience and an additional 60 college credits, the salary was $63,904, which is the lowest in the county. At Berkeley Unified, a teacher with equivalent experiences made $72,595 a year. The highest salary for Oakland teachers was $83,437, which is second to last in Alameda County. In San Leandro, the highest salary was $109,742. Oakland teachers do receive one of the best healthcare benefits packages—about a $13,500 contribution from the district—compared to teachers in nearby districts, who sometimes don’t receive any benefits. Despite that, some find it hard to ignore the long-term effects of the pay gap between Oakland and nearby districts. Hayes’ wife works as public school teacher in Albany. She makes about $7,000 more a year than him, and Albany also offers better resources and working conditions, according to Hayes. In May, after 18 months of negotiations, the union declared an impasse with the Public Employee Relations Board (PERB), the agency that administers collective bargaining agreements for employees of California’s public institutions. An impasse is invoked when the two parties are deadlocked. At that point, PERB assigned a mediator to the negotiations. Mediation sessions began on August 31. Last week’s demonstrations were planned to take place one day ahead of the most recent mediation session on September 26. Sbani and a group of about 10 teachers were out in front of Hoover Elementary, holding signs and passing out fliers with information about the negotiations to parents who were dropping off their kids. John Sasaki, OUSD communications director, declined to comment on the most recent mediation session. District officials’ most recent public statement on mediation was released on September 12. “The mediator assigned by PERB concluded the [September 10] session by stating ‘We’ve made significant progress in sharing information and running through various conceptual agreements on major topics,’” the press release stated. Brown considers the central issues of the negotiations—teacher pay and working conditions—as the primary factors causing Oakland’s high rate of teacher turnover. “It’s very difficult to maintain being a teacher when you cannot afford basic necessities, and not only basic necessities for yourself and your living conditions, but teachers are coming out of pocket for basic supplies like pens or pencils,” he said. Keen said that based on surveys she gave to teachers at Oakland International High School, 69 percent plan on leaving the district in the next five years. “All I’m doing is talking about the teacher crisis. To my friends, to my family, everyone,” Keen said. Recently, some signs of financial improvement were on display. At a school board meeting on September 12, district staff revealed that they ended the 2017-18 school year with a budget surplus of $29 million. The district also received additional state aid through AB 1840, which will provide a one-time package of $20 million to cover its deficit, but only if the district demonstrates better financial practices. Those practices include making significant budget cuts to the 2019-20 school year. Before the state aid package was announced, district staff and the school board were planning on making roughly $30 million in cuts to the 2019-20 budget. While the state aid may reduce the amount, but cuts are still expected—and that’s before accounting for a potential salary raise for teachers. The next two mediation sessions will be held on October 10 and October 23. If the two sides are unable to reach an agreement, the negotiations will move to a fact-finding phase. During fact finding, both sides present their best arguments to a neutral person appointed by PERB. The appointee then weighs the arguments and releases a recommendation for settlement to the public. The recommendation is non-binding, so the two sides continue bargaining based on the recommendation. Keen said that when she talks to people in Oakland about the negotiations, they are almost always supportive of teachers. But she believes many don’t quite understand just how dire the situation has become. “Oakland doesn’t realize how close its own backyard is to striking,” Keen said over the blaring of car horns. “Stand up, fight back!” the teachers responded in unison. Teachers and students demonstrating for a new contract outside of Oakland International High School.